Joe Guy had a brief and rather odd career. A promising trumpeter who was heavily influenced by Roy Eldridge, Guy's style looked ahead towards bop. However due to his heroin use, he never developed beyond a certain intermediate level and the results, although fiery, consistently sounded uncomfortable. Guy played briefly with Teddy Hill's Orchestra in 1938 (succeeding Dizzy Gillespie) and was a key soloist with the short-lived Coleman Hawkins big band of 1940. During 1940-42 Guy played regularly at Minton's Playhouse and he appeared on many privately recorded (and later released) jam sessions. His long solos, heard next to Charlie Christian, Thelonious Monk, Hot Lips Page and Roy Eldridge, usually failed to hold their own since he was not on their level; but then again he was just in his very early twenties. Guy worked with the big bands of Lucky Millinder, Charlie Barnet and Cootie Williams (in 1942 he encouraged Williams to use some of Monk's compositions). 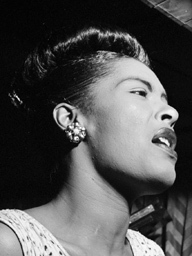 During 1945-46 was closely associated (both musically and personally) with Billie Holiday. However Joe Guy was eventually busted for drug possession and after 1947 very little was heard from him. He died in obscurity in his home town of Birmingham at the age of 41.